A massive communications tower on East Bay Regional Park District property collapsed over the weekend. The tower supports radio communications systems, including public safety communications, across the East Bay. Lt. Jon King said despite the tower falling on its side on the Rocky Ridge, west of San Ramon and Danville, sometime before Monday morning, no one was injured and all systems remained operational because the communication systems are built with backups. Police were alerted to the problem about 9 a.m. on Monday, Police officers responded and found that the cables that hold the tower in place had been cut, causing it to fall, prompting park police to seek the vandals who likely toppled it. police Capt. Mark Ruppenthal said. Investigators are trying to determine why vandals would target the tower, which is located in a remote area of the park behind multiple gates and fences. "It's not easily accessed," he said. 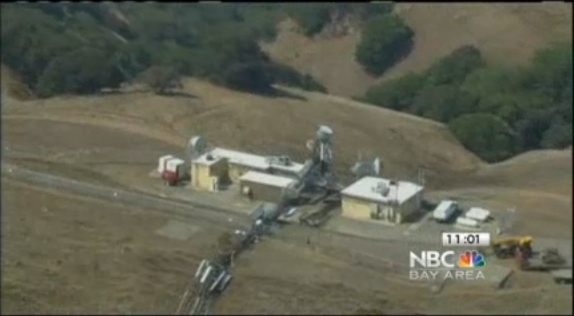 It’s unclear if this communications tower toppling is related to what’s been going on in the South Bay. Anyone with information about the East Bay tower should call park police at (510) 881-1833.